Watch what happens when dozens of miniature 2013 Subaru VX Crosstreks fitted with Subaru’s new EyeSight safety function take their different routs all at once. "The 2013 One Show Design Awards" on May 6th in the U.S. This year they had another great video called “Twinkle Twinkle Six Flags” that was a brilliant acoustic masterpiece that drew over 1 million views. Their newest creation expresses the EyeSight's "Pre-Collision Braking Control" function for avoiding collision or reducing collision damage by using a movie of many miniature cars making sounds. This is the sequel of the first Subaru miniature cars' video "The walk of minicar" which has been uploaded on their main website in August of 2012. One Show Design is a non-profit organization in the US, founded in 1975 and recognizes advertisers for outstanding work every year. It “aims to champion and promote excellence in advertising and design in all its forms.” The One Show is one of the three major international advertising, design and communications competitions along with "The Cannes Lions International Festival of Creativity" and "The CLIO Awards". Subaru has done a great job of marketing their new safety system, and accumulated sales of EyeSight-equipped models surpassed 100,000 units in Japan with the 106,735th model sold at the end of March 2013. The new safety system has been popular with buyers around the globe and Subaru's original advanced driving assist system was first introduced in May 2010. Last year, with the introduction of the new 2013 XV Crosstrek, 82.3 percent of XV Crosstrek buyers chose the new safety system which includes Pre-Collision Braking System, Pre-Collision Brake Assist, Pre-Collision Throttle Management, Adaptive Cruise Control, Lane Sway and Departure Warning and Lead Vehicle Start Alert. Since its first introduction in Japan, the EyeSight safety system has been highly praised due to its superior functions and affordable price. The new EyeSight safety system works like a second pair of eyes that monitors the road ahead and recognizes potential dangerous driving situations. EyeSight uses three-dimensional images captured by cameras mounted at the top of the windshield, and features audible and visual warnings to prompt the driver to take action. The new safety system will also apply automatic braking intervention, when necessary, to help avoid or reduce the severity of a detected frontal collision. See what happens when dozens of miniature 2013 Subaru XV Crosstrek cars fitted with the EyeSight function take their different routs all at once. 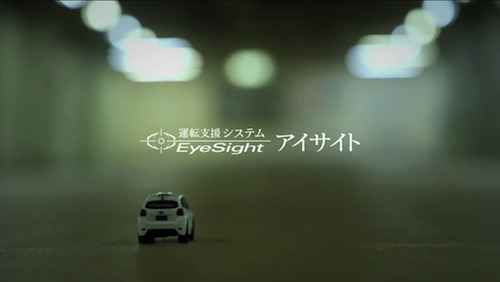 Check out the award winning video of Subaru's "EyeSight" collision avoidance technology demo.